Climate change continues to be a focus of Elizabeth Warren’s nascent presidential campaign. The latest sign came on Saturday when activists approached her at a campaign event in New Hampshire to sign a pledge not to take fossil fuel donations for her presidential bid. She did, becoming the first to sign the pledge for a 2020 presidential campaign. It’s becoming increasingly clear climate change will be one of the defining issues of the Democratic presidential primary. Candidates have staked out positions early on, including Warren who has said through a spokesperson that she “supports the idea of a Green New Deal.” Signing onto the no fossil fuel pledge is an even bigger step toward staking out her position. Taking the pledge means that a politician or candidate’s campaign will adopt a policy to not knowingly accept any contributions over $200 from the PACs, executives, or front groups of fossil fuel companies — companies whose primary business is the extraction, processing, distribution, or sale of oil, gas, or coal. We will provide a list of these companies upon request. During the campaign, Warren will have to abide by these rules or face backlash from the groups and other climate advocates. To see what that could look like, look no further than what happened with presidential hopeful Beto O’Rourke who recently was removed from the pledge after Sludge revealed he had taken big money from fossil fuel executives (though he had taken no money from fossil fuel political action committees, the PACs that the pledge mentions). Warren’s decision comes as a growing number climate activists, including the youth-led Sunrise Movement, call for politicians to stop taking fossil fuel money and back a Green New Deal. The issue has become a point of contention in Congress as well as on the campaign trail, with activists calling for House Speaker Pelosi’s new Select Committee on the Climate Crisis to bar representatives who’ve taken money from oil and gas. Meanwhile the groups behind the no fossil fuel pledge are likely to push more candidates to sign it or explain why they won’t as the presidential campaign heats up. Governor Jay Inslee, who has yet to officially enter the race but is planning a run, said he had also signed the pledge, according to an interview with HuffPost. 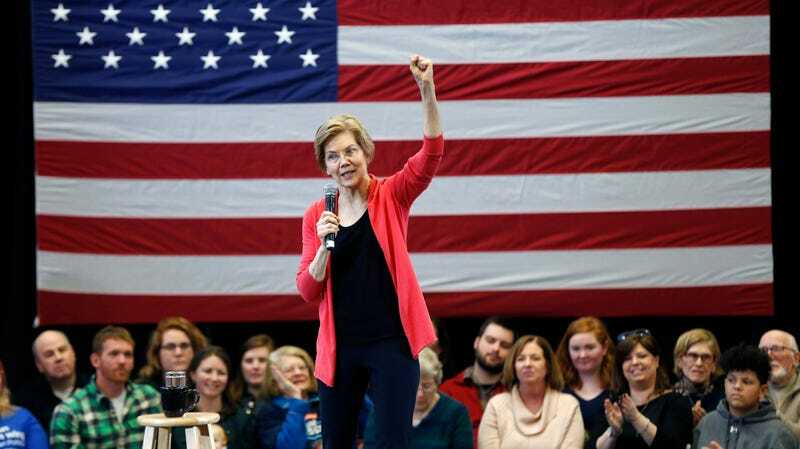 350's New Hampshire branch, which tweeted the picture of Warren with the newly-signed pledge, specifically tagged senators Cory Booker and Kamala Harris, both of whom are likely to enter the race at some point in the near future. Representative Tulsi Gabbard and former Housing and Urban Development Secretary Julian Castro also entered the presidential race late last week, and it remains to be seen whether they’ll commit to no fossil fuels for their presidential bids. Gabbard already signed the pledge for her 2018 congressional campaign.